HP Umpire Jeremie Rehak ejected Dodgers injured list/C Russell Martin (strike three call; QOCU) in the bottom of the 4th inning of the Brewers-Dodgers game. With two out and two on (R2, R3), Dodgers batter Austin Barnes took a 3-2 fastball from Brewers pitcher Zach Davies for a called third strike. Replays indicate the pitch was located off the outer edge of home plate and waist-high (px 1.11, pz 2.1), the call was irrecusable. *^ At the time of the ejection, the Brewers were leading, 2-1. The Brewers ultimately won the contest, 4-1. This is Jeremie Rehak (35)'s first ejection of 2019. Jeremie Rehak now has 2 points in the UEFL Standings (0 Prev + 2 AAA + 0 Irrecusable Call = 2). Crew Chief Gerry Davis now has 0 points in Crew Division (-1 Previous + 1 Irrecusable Call = 0). *UEFL Rule 6-2-b-5 states that all ejections of players/coaches not on the active roster shall be associated with the UEFL rule concerning Irrecusable Quality of Correctness. Therefore, this ejection is QOCU for the purposes of UEFL league play. *The pitch was located 2.352 horizontal inches from the outer limit of borderline px range. This is the 19th ejection report of the 2019 MLB regular season. This is the 12th player ejection of 2019. Prior to ejection, Martin did not play (Injured List). 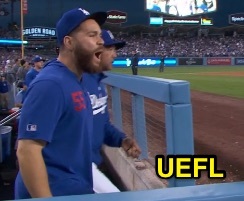 This is Los Angeles' 1st ejection of 2019, T-1st in the NL West (ARI, LAD, SD 1; COL, SF 0). This is Russell Martin's first ejection since July 27, 2017 (Will Little; QOC = Y [Balls/Strikes]). This is Jeremie Rehak's first ejection since September 9, 2018 (Brett Gardner; QOC = Y [Balls/Strikes]).